Thank you for directing me to the Elmswell History (web)site, as a result of which I spent last night glued to the computer. In the photographs of Elmswell Bacon Factory is one of a retirement group – Ronnie McLegan is included. 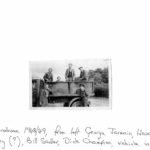 He was a wartime evacuee from London who stayed with my wife’s grandparents in their farm at Thelnetham near Diss – he never went back to London. I still hear him occasionally on local radio answering the quiz questions. Under the name Hurrell on the website is listed Kevin, my cousin. 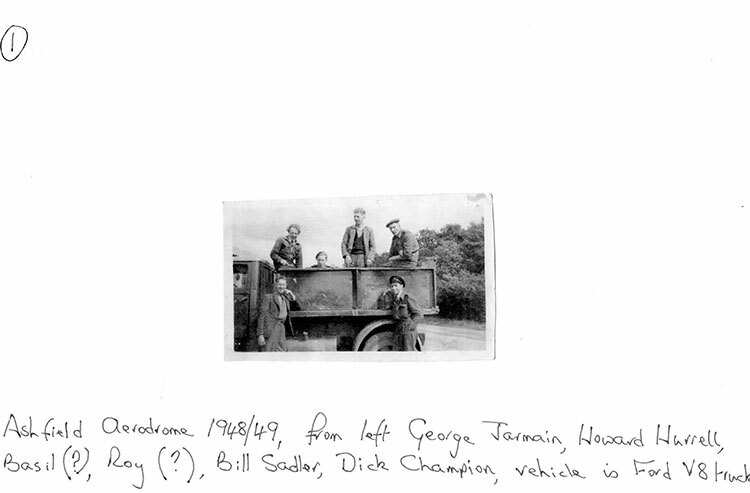 He is shown on the photograph of the Youth Club outing – it was he who owned the hairdressing business at Pightle Close referred to in the history pages. This business was then sold to my wife’s uncle. The other Hurrell is recorded as Harry – this would have been my father, Howard Charles Hurrell, born 31st March 1919 at Walsham-le-Willows, died on 1st December 1993 at “Shangri-la”, New Road, Elmswell. 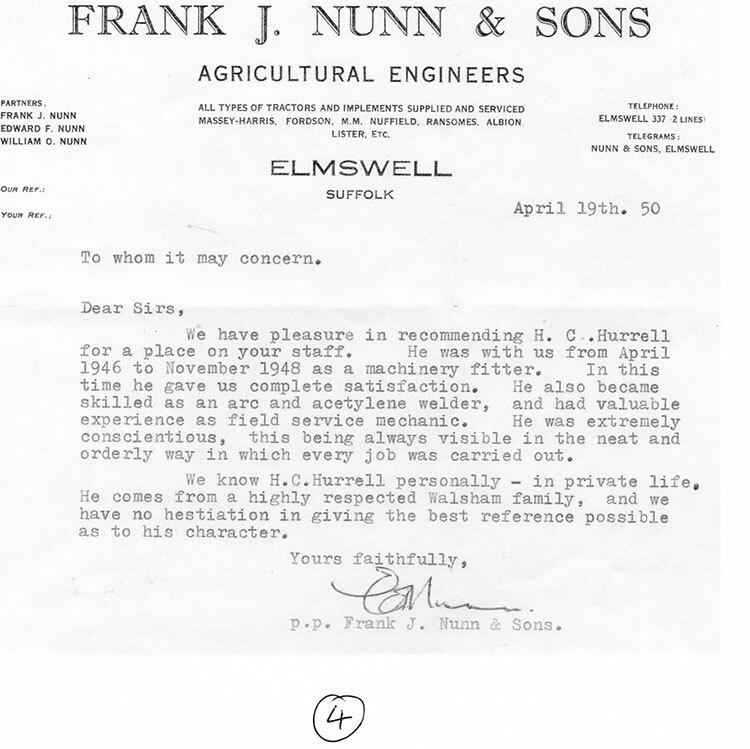 After his war service, Royal Artillery, Dad worked for the Air Ministry [Notes 1+2 below], then Frank Nunn [Notes 3+4] before moving to Tate & Lyle. 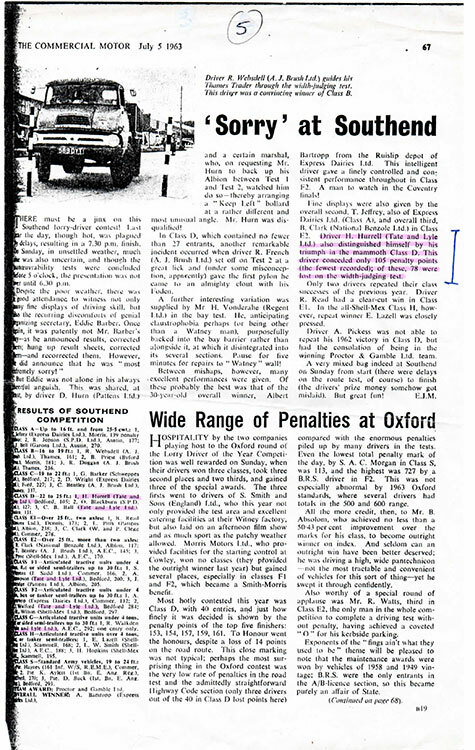 The drivers really prided themselves on their abilities and entered the Lorry Driver competitions, usually bringing home a number of trophies [Note 5]. I can still remember the awful sound of the metal hoes being used on the steel floors of the lorries to remove the spilled sugar. In the days before mobile phones, (lorry driver) Ronnie Last failed to return from a journey to Norwich, then Cantley, to load up and return to Elmswell. He had been stuck in a snowdrift near Cantley, and had to spend the night in a very cold lorry. I can also remember Albert Farrow hearing the fire alarm bell at Tate & Lyles, running for his bike and pedalling like mad on the long trip to the Fire Station. The barber shop in Ashfield/Station Road was an experience! Dad usually took me there after he finished work Saturday lunch-time. By then you opened the door and walked into a “pea souper” of Capstan Full Strength, Player’s Navy Cut, and Condor – secondary smoking! It made you feel like a 40-a-day man at nine years old! Another Saturday job was to go to the mill near the station for the rabbits’ food and chicken feed as we kept both. After they married, Mum and Dad lived in Ashfield Road, and our near neighbour was a blind gentleman who wove the most intricate baskets. Water was from a well which the owner locked up one day a year to preserve his ownership. Woe betide anyone who had not filled up all the saucepans, etc., for the coming day. 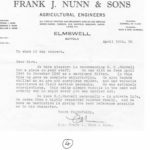 In 1953 my parents had purchased a plot of land in New Road – approx. £100 – and had our bungalow built there – just under £500 – and although I was born in Ashfield Road, we moved to New Road later in 1953. Ours was the first bungalow on the left going up to Newsomes Corner, we used to hear Anderson’s hooter going off at lunchtime and for the end of the day. 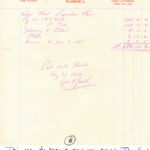 Cycle repairs were carried out a couple of houses down, and Fred Wright’s shop supplied most of our needs. Mr & Mrs Wright lived next door to us, and I can remember going to theirs on a Saturday night to watch television as a child – we had just a radio. The garden (at our New Road bungalow) was large so we grew nearly all our vegetables. Chickens were kept under the fruit trees near the pond, and rabbits in hutches. The car [Note 6] was kept in a wooden garage which, as cars became longer and wider, was added on to, with the result that it was a strange building when viewed at an angle. My mother, Dorothy Edith HURRELL (née Banks) was born on 9th June 1922 in Sidcup, and she passed away on 9th November 2013. She had been a teacher prior to moving to Elmswell [Notes 7+8]. The Church Hall is mentioned in the history pages. Dorothy often recounted having to stand at one end of the hall, facing her class, while Grace Goddard stood at the other end, facing her half – whoever talked loudest had the children’s attention! Grace was very proud of her “transiter” radio, as she called it. Staff at the school when I was there included Mr Kirby, Mr Proctor, and the Secretary was Mrs McSweeney from Woolpit. I met her last year after a 50-year gap and recognised her straight away. On Picture 4 I believe I am the one in the middle, with the badge on the blazer. On Picture 1 you can see a tall mesh fence next to the road. I cannot remember who it was but someone managed to kick a football over it into the road; just then the 204 bus came along straight over it. Picture 20 – no scaffolding and us kids running around the builders. Health & Safety?? No, just common sense. I believe it was Mr Proctor who stood on the roof of the extension dropping items from it, i.e. feathers, piece of paper, etc., to give us an early Physics lesson. P.E. (Physical Education) involved getting the equipment out of the Dining Hall cupboards, setting it up, and then using it on the tarmac playground – if you fell off the balance bar, it hurt. The temporary classrooms were supposed to be a short-term measure, but were never replaced; they had thin walls, concrete floors and lots of windows. It was like being taught in a fridge in winter. Class sizes were supposed to be below 30, but were never achieved. Sorry if I have “rabbitted on”, but once I started I found more to write down. 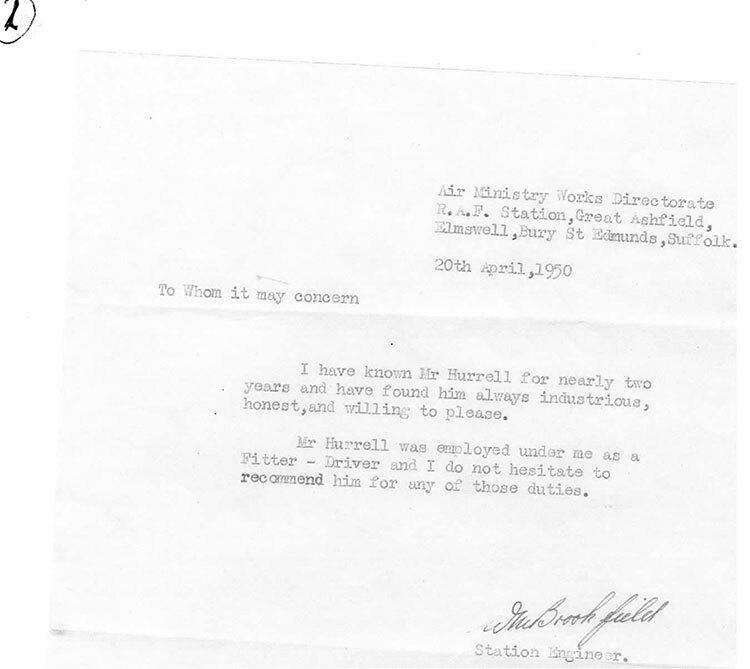 Notes 1+2 – see picture of Ashfield Aerodrome 1948-9, and reference from Great Ashfield RAF Station, dated 20th April 1950. 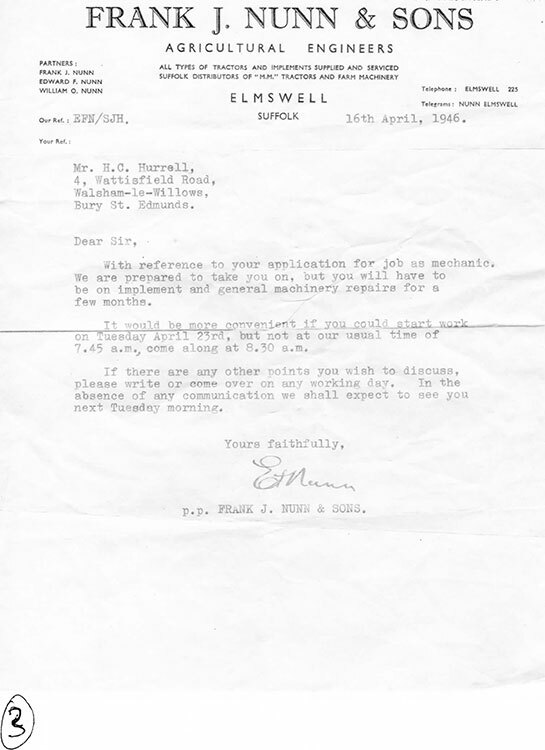 Notes 3+4 – see Nunn’s appointment letter dated 16th April 1946 and Reference dated 19th April 1950. 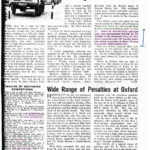 Note 5 – see article from “The Commercial Motor” magazine dated 5th July 1963, the relevant sentences in which are “Driver H Hurrell (Tate & Lyle Ltd) also distinguished himself by his triumph in the mammoth Class D. This driver conceded only 105 penalty points (the fewest recorded); of these, 78 were lost on the width-judging test.” There were also other drivers – Mr C B Ball, Mr A Sampson, Mr L Walford, and Mr I R Walkden – from Tate & Lyle’s who took part in this competition, but it is unclear whether these were from the Elmswell depot. Also, see six sheets of photos dated (by Stewart)1963-68. 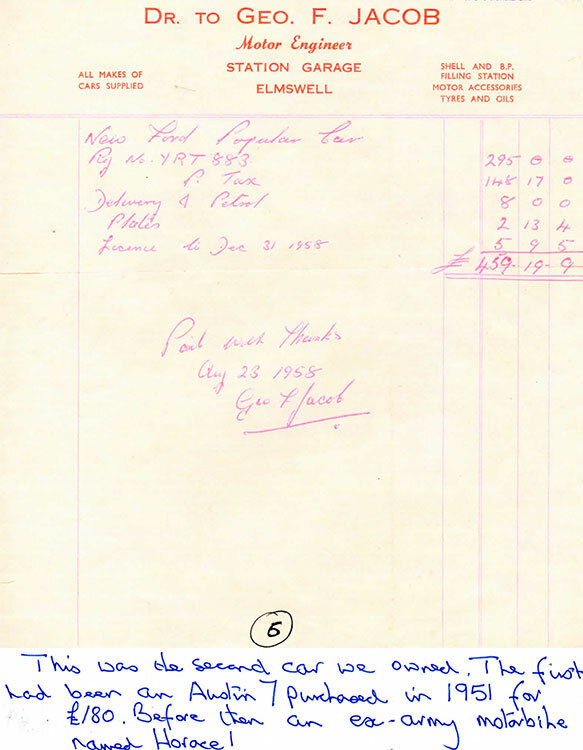 Note 6 – see invoice/bill from Geo.F.Jacob (Motor Engineers) dated 23rd August 1958 for a Ford Popular car which Stewart says was the Hurrell’s second car, the first had been an Austin 7 purchased in 1951 for £180. Before then, (they had) an ex-Army motorbike named Horace! 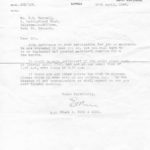 Note 7 – Stewart has kindly donated several school photos (1970’s? ), which will be on this website as soon as we have managed to put as many names to the various faces as possible. 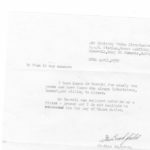 Note 8 – Stewart has also donated a collection of 31 original items (dated 1927-1954) of personal letters, documents, certificates, art books, ration book, etc., all about his mother, teacher Dorothy Hurrell. On 26th May 2015 these documents were passed to Bury St Edmunds Record Office for cataloguing and safe-keeping (B.R.O. Ref: EN.3948).